Today I have another little break from knitting stitch patterns for you, Shell Pattern Lace from a turn of the century hand written notebook. This knitted lace is very much like Kilgorie Edge, but with a much wider heading, and I think the differences make this version more elegant. 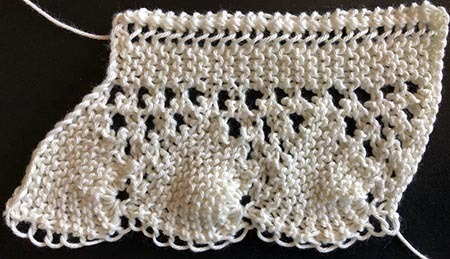 Fans of Knitting-and.com may already know that I have a real passion for knitted lace edgings, and I’ll be adding many more over the rest of this year and 2019.